There were three FA Cup third round replays down for decision on Tuesday. Ireland's Lenihan scoring his side's second goal against Newcastle. 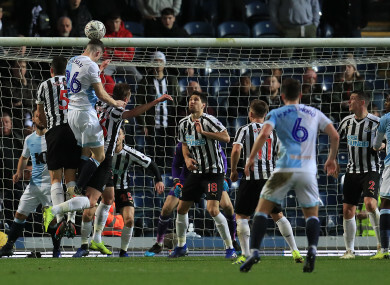 REPUBLIC OF IRELAND’S Darragh Lenihan was on target for Blackburn but they failed to pull off an FA Cup shock against Newcastle after their third round replay went to extra-time. Newcastle survived as they blew a two-goal lead before hitting back to win 4-2 in the end. And the Republic of Ireland international Lenihan equalised for Blackburn with a header in first-half stoppage time. It took extra-time to settle the tie, with Blackburn’s Bradley Dack missing a golden chance before Joselu pounced to slot home in the 105th minute after Rovers goalkeeper David Raya spilled Fabian Schar’s drive. Yet injuries to Ireland’s Ciaran Clark and Jamaal Lascelles will cast a shadow over the win for Benitez. Email “Ireland's Lenihan on target, while Sheffield Wednesday book date with Chelsea”. Feedback on “Ireland's Lenihan on target, while Sheffield Wednesday book date with Chelsea”.